As an entertainment journalist, there are certain movie and TV series titles that make my job harder than others. Jordan Peele's recently released Us, for example. (And This Is Us, for that matter.) Netflix's You is another one. Despite being short and simple, it makes writing headlines a little bit of a pain. But the latest contender is annoying for a reason that should become immediately clear as soon as you lay eyes on it: Pet Sematary. Why, oh why, is it spelled like that?! The 2019 reboot of Stephen King's classic, terrifying story - which was first published in 1983 and adapted for the big screen in 1989 - is now in theaters. Which means that it's now all over social media, in giant headlines on ads in the city where I live, and plastered all over freaky commercials that will keep me awake for a week straight (at least). But in addition to being creeped out by all the screeching cats and zombie children, the heinous spelling of "cemetery" is also enough to give me chills. In order to explain why King opted for an unorthodox spelling, I need to shade in a few of the plot details for you. The horror film follows Louis Creed (Jason Clarke), who moves into a sprawling rural home in Ludlow, ME, with his wife, Rachel (Amy Seimetz) and their two young children, 8-year-old Ellie (Jeté Laurence) and toddler Gage (twins Hugo Lavoie and Lucas Lavoie). Not long after they arrive, their neighbor Jud Crandall (John Lithgow) informs them about the eerie pet cemetery located in the woods bordering their home, which isn't your average burial place for beloved cats and dogs. Instead, when dead pets are buried on a plot of land just beyond the pet cemetery in the woods (which used to be a burial ground for the Micmac tribe), sometimes they come back, albeit in a much more aggressive, evil, zombie-like state. 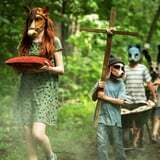 Even though the Creeds live on the land, kids from Ludlow have no problem roaming freely as they perform burial rites for their deceased pets (they wear animal masks, beat a drum, and a ton of other stuff that will make you never want to procreate). If you've read any of King's work, then you know that creepy children are a trope that he loves to infuse his stories with, from The Shining to Children of the Corn. The film doesn't really get into this, but he expands more on the band of kids who use the cemetery more in his novel. When the kids in town discovered that the land brought their pets back to life, they took a bit of ownership of the graveyard and continued the tradition of covering their pets in the soil there over the years. In the story, the burial ground full of necromantic power is able to revive animals such as bulls, cats (RIP Church! ), and dogs. The remake's version of Jud mentions that his childhood dog Biffer (who was "a hell of a sniffer") was buried there, but came back far meaner and more aggressive than he was before, leading to his father putting him down (again). In King's novel, a soldier named Timmy Baterman is buried in the cemetery by his grieving father, and comes back possessed by the Wendigo - the demon who possess the cemetery. Jud and other townspeople beg Timmy's father to kill his reanimated son, which he eventually does before taking his own life. Because these young kids became the cemetery's caretakers, so to speak, they're also the ones who wrote the sign that reads "Pet Sematary" - the spelling error can simply be chalked up to the fact that a young child who doesn't have a perfect handle on the English language is the one who painted it. What's even more interesting is King's connection to a pet cemetery he encountered in his own life. The author has said the inspiration for this story came from real life, which he explains in the forward of later editions of his book. Fresh off the success of Carrie, the author was invited to be a writer in residence and professor at the University of Maine at Orono in the late 1970s, which also happens to be his alma mater. He promptly moved his family to a rural home in Orrington, MI, that abutted a road that frequently had big trucks zooming by. As a result several lives of the local pets were claimed, and the kids established a pet cemetery in the woods. According to King, he visited it and saw that it really was marked by sign that read "Pet Sematary."